Thank you for your kind response to yesterday's quilts. Today I want to share with you the quilt I made for my sister-in-law and her husband. I have named it "Comfort & Joy". This quilt was offered by my local quilt shop as a block of the month. We went to a monthly meeting and were shown new patterns and techniques and then could purchase each monthly block for $5. At the end we had enough blocks to make a quilt and then purchased the rest of the materials to complete it. Tomorrow I will show you the last of the quilts I made for Christmas. Isn't the gate to the farm just charming? 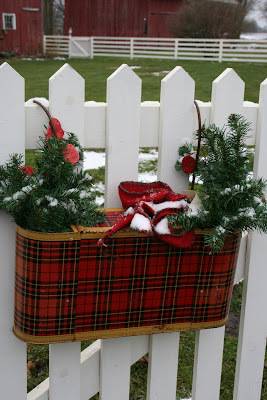 It is such a welcome sight to drive up and see it decorated so beautifully for Christmas. Have a wonderful day! The gate is charming, and the quilt ... even more so! It is so beautiful. What an amazing gift for some lucky person. The gate looks perfect, too. Love your choice of fabric! What a wonderful gift! Perfectly named. I can imagine what comfort and joy it will bring to the recipricant. I love Christmas quilts. Yes that gate decoration is so sweet. Perfect name for that perfect quilt!! The quilt is beautiful! I'm sure it will bring much comfort and joy to your sister-in-law and her husband. 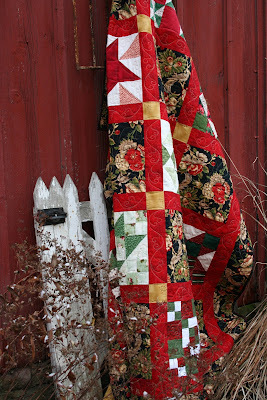 I love the quilt and the fence is so beautiful!! Great job on the quilt- I'm sure they will really love it. I really like the widget of the pictures of your quilts over on the right hand side. I don't remember seeing it before, but it is really neat!! Have a Merry Christmas!!! !